GOMA, Democratic Republic of Congo — Ever since the ex-CNDP, parts of which now call themselves M23, retreated to Rutshuru territory near the border area with Rwanda and Uganda, intense fighting has broken out in various localities, including Runyoni, Bunagana, and Jomba. The town of Kibumba, near the Nyiragongo volcano, which lies around 20 km north of Goma, was also the scene of recent clashes between the Congolese army and M23 fighters. The fighting has displaced tens of thousands of civilians, who have crossed into neighboring territories and countries. 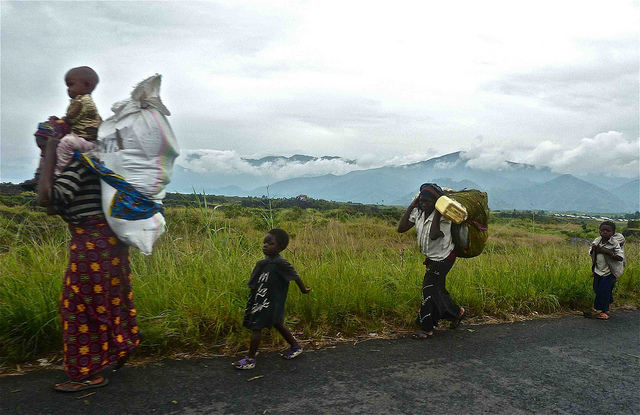 The latest figures show that over 8,200 and upwards of 30,000 Congolese civilians have fled into Rwanda and Uganda respectively. The fighting in Kibumba, for example, displaced around 6,000 people on May 7 and 8, according to the U.N. Office for the Coordination of Humanitarian Affairs. Figures of displaced for the Jomba area where clashes broke out a week ago are not yet available. Amid this intense fighting, the parties to the conflict have traded allegations of wrongdoing likely in an attempt to justify their struggle in the eyes of the Congolese people and possibly the international community, which has been following the conflict as well. A popular Congolese radio reported last week that Rwandan officers allegedly sent demobilized FDLR rebels to Congo through Ruhengeri, quoting to two fighters who escaped and sought refuge at the local chief of Ntamugenda, close to the clashes in Jomba. If true, this would stand in stark contrast with recent concerns expressed by the Rwandan army that the FDLR was rearming and reorganizing with the help of the Congolese government. While no proof has been seen so far of collusion with the FDLR, the U.N. mission indicated that it has evidence indicating Rwanda has been training and arming Rwandan nationals and sending them to fight in the rebellion across the border. The internal U.N. report, seen by the BBC, said that the recruitments began as early as February. All of these allegations, stemming from an obvious lack of trust between Kinshasa and Kigali, are clouding joint discussions ostensibly aimed at devising a plan to eliminate the threat of the FDLR. At the end of the fifth session of the Joint Commission on bilateral relations in Kigali on May 19, the high-ranking Rwandan and Congolese representatives agreed to have their intelligence officials present a joint strategy to defeat the FDLR within 10 days and to expand the sharing of intelligence on the border area, among other things. It remains to be seen what kind of carrots and sticks this new strategy contains, but given the low trust between the two governments and the shrouded alliances each of them has with non-state armed groups, it is hard to imagine that a genuine solution to the problem of the FDLR is close at hand.